Laos, the Land of A Million Elephants, is a landlocked country in southeast Asia lying between Thailand, Vietnam and Cambodia. 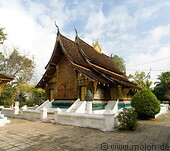 Laos traces its history back to the Kingdom of Lan Xang which existed from the 14th to the 18th century. Laos is a mostly mountainous country with some plains and plateaus. The Mekong River forms a large part of the western border with Thailand, while the mountains of the Annamite Chain form most of the eastern border with Vietnam. Laos is a relatively less developed socialist country, which however has started implementing economic reforms in the 1980s. Development has been quite fast over the past five years with huge changes takng place since my first visit to Laos in April 2000. The villages surrounding Luang Prabang for instance mainly consisted of traditional style wooden houses with tree leaves roofs in the year 2000. In December 2005 most of these traditional houses had been replaced by houses of concrete. In all places which I visited in December 2005, even the most remote, there was cellular coverage.